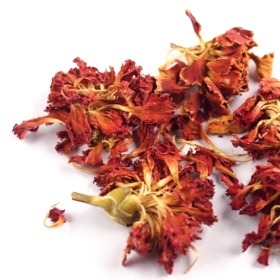 Carnation Flower Tea is the dried flower of the actual carnation flower. Carnation Flower Tea is a healthy tea to take daily. It contains many kinds of natural minerals that the human body needs. Carnation Flower Tea helps to improve blood circulation, and strengthens metabolism. It is also a natural cleanser and breaks down toxins in our bodies. It is especially beneficial to women who have irregular period. However this tea is not suitable for women who are pregnant.